Hebrew is a special language, created by the union of the Lights and Kelim. 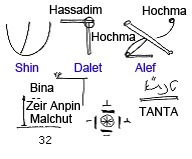 Malchut unites with Bina, and this causes the emergence of the inclined border (Parsa) in the letter Alef. The Light of Hochma comes down to Malchut from Sefira Hochma above, and is depicted by the letter Yud. The part that expands below forms the lower Yud. And if there is no Light below, the place of Yud will be occupied by Dalet. That is how the letter Alef is formed. 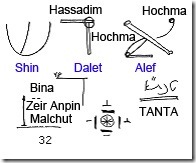 The letter Dalet is the combination of two axes (Delet means “door”) – the doors that close and open the Rechem (the womb of the spiritual Partzuf). The horizontal axis is the spreading of the Light of Hassadim, and the vertical one is the Light of Hochma. The letter Shin reflects the three lines. The Ari explains the number and shapes of the crowns that are needed over each letter. The whole TANTA (Taamim, Nekudot, Tagin, Otiyot) – Lights, letters, dots, and crowns over the letters – are the reflection of the direct connection between the Lights and the Kelim. That is why it is so important to know how this connection is expressed. After all, it isn’t merely language, but the connection between the Light and the Kli upon which the whole universe stands. Therefore, these letters and the language itself are called holy, for they show how the Kli wants to become similar to the Light. When Malchut ascends to Zeir Anpin and Bina, she joins with them and thus the 22 letters are produced, reflecting Malchut’s likeness to the Upper Sefirot, up to ZAT de-Bina, where Malchut receives the qualities of Bina. Ascending from Malchut de-Malchut (the black dot), she begins to deflect, thus creating a line to the right or to the length, lengthwise and widthwise, as well as all kinds of shapes or circumferences when she reaches perfection. On every degree of the ascent Malchut connects to Bina and draws the forms of their unification. This is how letters are formed. A kinescope works by the same principle. It contains a deflection system: a plus and a minus along the vertical axis, a plus and a minus along the horizontal axis, and in the middle an electrical beam which moves wherever all these pluses and minuses draw it to. As it moves, it draws all sorts of forms. With time these sequential forms overlay and clothe one another. Similarly, via the joint work of two pairs of forces (potentials), Hassadim (left and right) and Hochma (above and below), the point is drawn from left to right and from above to below, thereby forming all the different letters. These forms clothe one another, and the letters form a sequence that we call the alphabet.